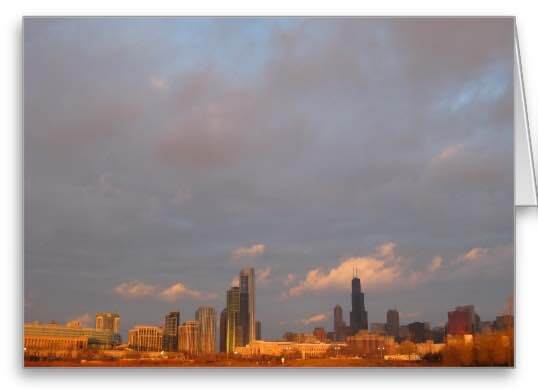 Greeting card featuring Chicago Skyline At Sunrise photograph. Available in three sizes, all our cards can be ordered blank inside – or you can customize them with your personal message! Visit our online art store now to see all the colorful cards we offer. We’ve created a beautiful line of greeting cards featuring original astrology art. Choose from the 12 zodiac symbols, or select a painting or photography style (like the Chicago Skyline At Sunrise greeting card shown here) in a design especially suited to your taste or zodiac sign or your card recipient’s personal style or sign. Our greeting cards give you a great way to send a special message to a special someone. 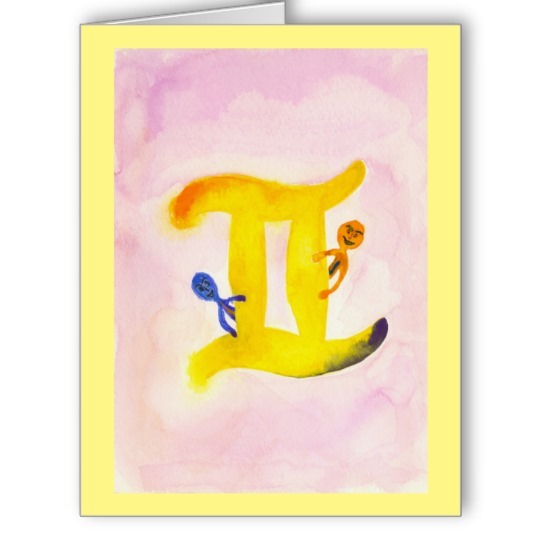 Or use them for your personal stationery – the zodiac symbol watercolor cards are a wonderful way to express your unique astrology. Cards come blank inside so you can write your personal message, or you can customize them with a printed message inside in your choice of text, font, and color. You can customize your cards at no extra charge. Customize them fully inside to suit your style, your message, or your recipient’s personality. Choose the font color, style, and size you like, and include your own special message, saying, or quote to make this greeting card your own. You may add your customizations to most parts of this folded card: front plus both inside panels. Choose a colored background, too, as shown here in the Gemini The Twins zodiac big greeting card’s yellow background. As you’ll see in our online art store, many of our big greeting cards feature a special colored background to harmonize with the main image on the front; you can order these cards in the two smaller sizes as well. And you can add a colored background to any of our cards and simply adjust the image size to show the background as a border. All our cards help you bring “the beauty of art and the intelligence of astrology” into your daily life. Visit our online art store now to see all the colorful cards we offer. 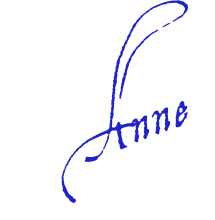 They are wonderful for sending to anyone, and they make a lovely, meaningful statement when sending your good wishes to loved ones, colleagues, and friends. All our premium designer greeting cards are inspired by astrology. That makes it easy for you to enjoy living harmony: not only are these cards beautiful, they’re practical and powerful because they help you and all your recipients be your best selves. And keep in mind: you can make these cards your own, because all our cards can be customized! Let our cards touch your heart and speak to your soul. Just looking at them can help renew your spirit and reawaken your inner self. Relax, enjoy the colors and textures, you’ll find yourself “living in harmony,” easily, naturally, and beautifully.